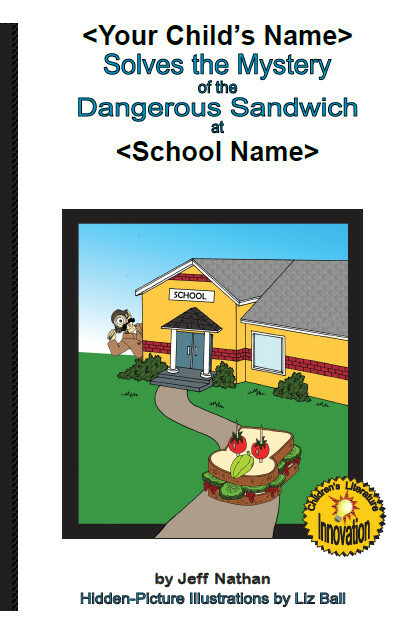 choose-your-own-path humorous mystery for elementary-aged students. Make Your Students Published Authors! Don’t Let That Stop You! We can work with virtually any budget. My grant writer may even be able to get funding FOR you. If you can't see the video above, it may mean that your school network has blocked YouTube access. To view a different version in your Media Player Click here. Do you want to get your students excited about poetry? Do you want them to absorb the most troubling aspects of language arts in "an atmosphere of laugher and enchantment?" (See 9th testimonial, below.) 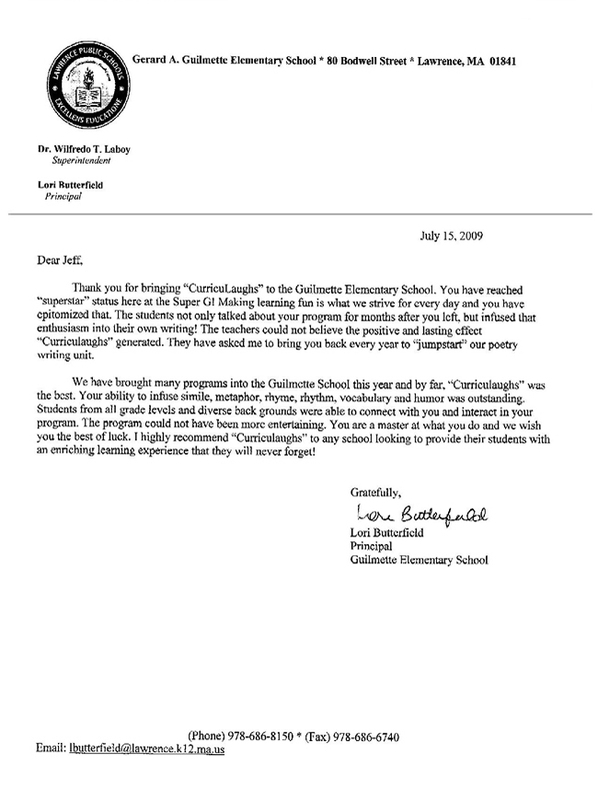 Do you want them to beg their teachers to allow them to write poems (see first principal letter, below) and start writing poetry DURING THEIR OWN FREE TIME? (See 10th testimonial, below.) Jeff Nathan, award-winning children’s author and creator of PunOETRY™, has created CurricuLaughs, a unique set of hysterically entertaining children’s assemblies that focus on EDUCATION THROUGH HUMOR. They get the right-brain to help the left-brain to open up and learn. Children, while learning poetry and language arts lessons from a different angle, see these new educational adventures as “hilarious” and “fun” while teachers and administrators are no less ecstatic about their educational value. Jeff guarantees CurricuLaughs to be the BEST, most FUN, most EDUCATIONAL language arts assemblies your elementary school has EVER HAD or you don't have to pay for them! 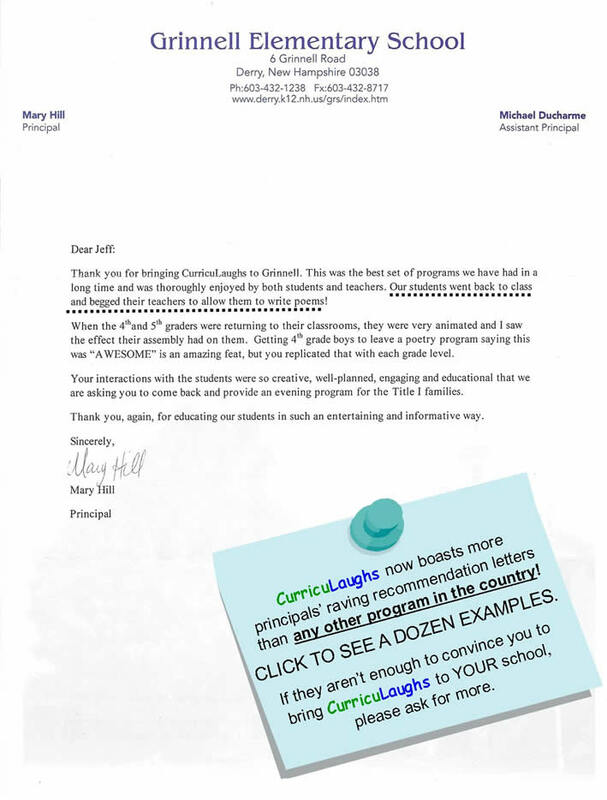 CurricuLaughs now has fabulous programs for grades 6-8, too. See the testimonials. "This was, by far, the best set of presentations I have seen in our school system – funny, informative, inspiring, the kids LOVED them, AND they presented some difficult MCAS concepts, like similes and metaphors, in a uniquely humorous and dramatic manner that the kids can relate to and remember. I am anxious to bring these programs to the rest of the district." "Thank you so much for the truly remarkable show. I have no doubt that I could write a nicely worded, long, drawn-out appreciative thank you letter. But it would by no means illustrate how truly captivated the students at RMMS were with your show. So I will simply quote a student who said it best "You Rock!". From the mouth of babes, Jeff you were sensational. Thank you ever so much!" “Your program was truly wonderful. The students were engaged and incredibly interested in your presentation. They were with you for the entire program. The fact that you had such a diverse presentation meant that they were entertained and they were challenged to participate. I thought your demonstration was refreshing and fun. You embedded the educational skills within a spirited delivery. Thank you for your energy. I appreciate your effort and time." 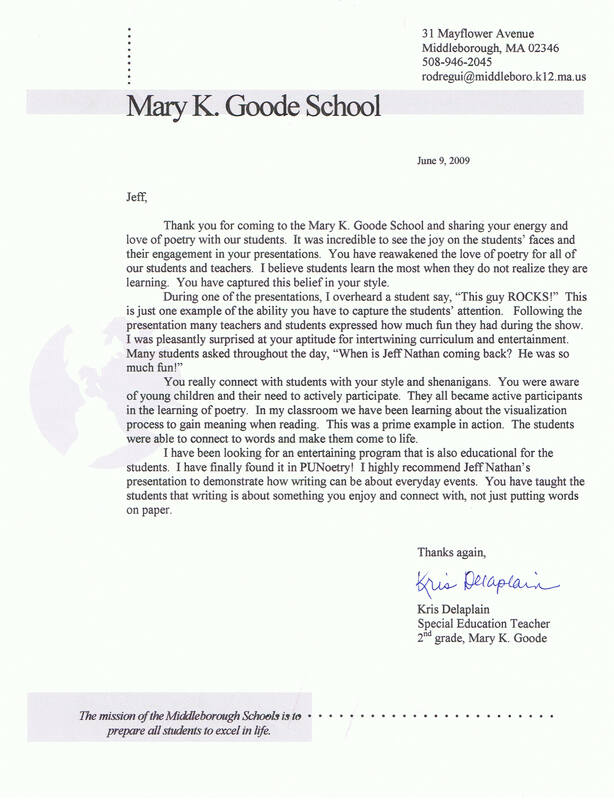 "...I want to thank you again for your outstanding presentation at our school. I really enjoyed watching how you brought poetry to life. The children were enthralled with your mannerisms and slapstick humor. I have heard nothing but positive comments from students, staff, and parents. ... Please feel free to use me as a reference." Continue reading these "tons of testimonials" or click here to jump right to the video preview. 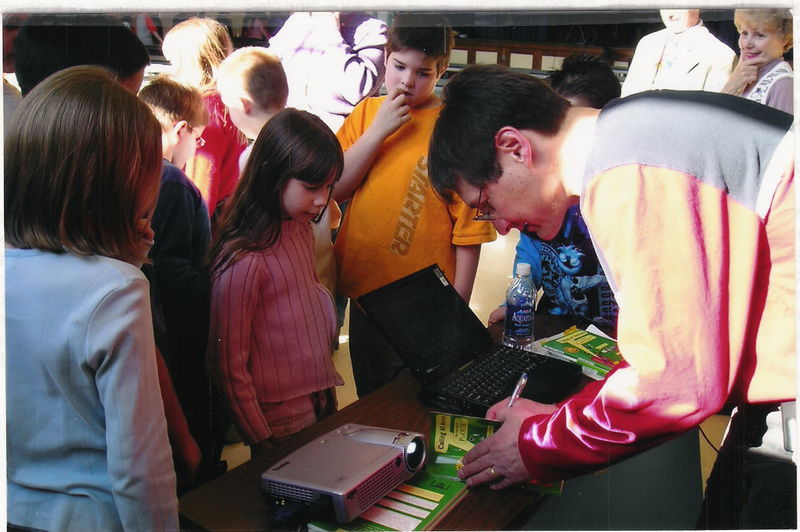 “This was the best visiting author program that I can remember bringing in for the children. After last year, the staff—the 4th grade teachers, in particular—asked if they could bring you back again this year. They talked to the cultural enrichment person because they felt that the kids got a lot out of your presentation of metaphors, similes—the things that the kids get confused about. The teachers feel that they are trying to come up with creative ways all the time to help and you did just that. They thought it made an impression on their students and they also thought that it was great for them to hear a lot of things come from you that they are saying every day in the classroom—that it’s not just the teachers drilling it into them, that there was a reason for it and they could see the results in your books. There’s been a lot of positive feedback from the teachers. One of the grade 3 teachers was going on and on about how great their session was, how the material you presented was very relevant, the kids enjoyed it, and it was interactive. "In my fifteen years of teaching, I have never seen a performer like Jeff Nathan. In addition to being captivatingly funny, musical, and whimsical, he provides curriculum-tied educational content in a multi-sensory format that makes poetry accessible to all children. If you only have one author visit your school, this is the one to get." "Jeff Nathan’s appearance at our school truly inspired teachers and students alike. 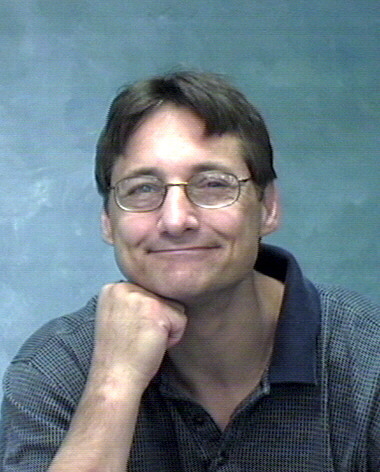 His use of humor, song, and drama help to “catch” and “capture” the students’ interest in both reading and writing poetry. We are looking forward to making poetry a part of our everyday school life here at the JFK." "I can honestly say that this was one of the best assemblies that we have had in recent years...Jeff was here for the whole day and was well worth the reasonable fee he charged. He did three separate group assemblies for different age groups and also visited three fourth grade classes. The group assemblies were very age appropriate and humorous. He talked about the elements of poetry, ideas to begin the writing process, and specific elements like similes and metaphors. I highly recommend you consider hiring Jeff Nathan to do an assembly at your school..."
"Mr. Nathan's assembly was educational and entertaining. It is a great way to get across poetry curricula in a way the children love. This was our second year in a row having "Sherlock Poems" at our school. The students, staff and administration were thrilled to have him return!" Here are a few quotes via newspaper articles. There are many more with the other articles, ..
"[Nathan] does what I look for in an enrichment program," Mountain View principal Carolyn Wallace said. "He brings things the students can use right now and the fourth grade teachers are very pleased with the work he does with poetry." "His humor is definitely at the kids' level, as are his words and his concepts," Wallace explained. "I wouldn't be surprised if we invited him back every year because the students learn different things every year. This is a program where children aren't learning the exact same thing at each level." "He's talking about similes, metaphors and alliteration, and it's good for the students since testing is coming up," Langille said. "It's unusual to find someone that can hit all the different grade levels. I definitely would recommend him to another group." "He was great and I am not usually interested in poetry." ... see "Press" page for complete articles and MORE articles. "The Tobin School in Cambridge had the great pleasure of hosting author/poet Jeff Nathan at our school to help us celebrate Read Across America Day on March 8, 2008. He met with our Pre-k to 6th graders. ... Jeff's programs were very well planned and performed. Besides being on target for reinforcing language arts skills, he was so entertaining and engaging. Using movement, singing, drama and multimedia, he had students and adults spellbound and participating fully in the show. Jeff did a special program with the 4th and 5th graders in the afternoon on the magic of words, such as alliterations. A terrific time was had by all!" "Over 200 enthusiastic attendees! The students were so enthralled with your daytime visit that they insisted that their families come back for the evening performance. The full-day and evening programs were both educational and entertaining. 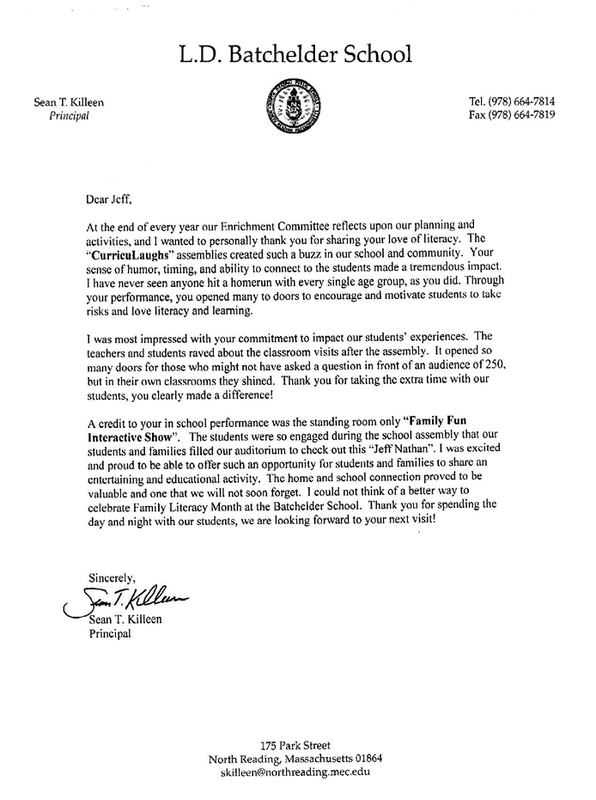 Students, teachers, parents and I enjoyed your visit and we're hoping that you can come back in the future." I just wanted to thank you for your wonderfully entertaining show the other night. I received a lot of positive feedback from parents and kids alike. The audience was delighted with your silly poems, humor, and antics. You had their full attention and I could tell by their smiles and giggles that they were thoroughly captivated with your performance." "Your program was wonderful. Thank you for a humorous, informative, and well-liked show. The children LOVED the assemblies and hope to see you again next year." "Author and Poet, Jeff Nathan, presented an exceptional program to the Doyon School in Ipswich, MA. My fourth grade students were highly engaged in Jeff's humor as well as the content. The material presented was most relevant to the language arts curriculum. I especially liked how Jeff introduced figurative language, as it is a particular area that many students need practice in. Jeff was skillful in using a multi-model approach that incorporated drama, visuals, and great examples of his original poems. The children left feeling 'inspired to write' and that can only help me achieve my goal as a teacher - for all my students to feel joy in writing!" Donna Contini Grade 4 Teacher Doyon School Ipswich, MA. "Wow! Did my class enjoy your performances at our school! Thank you so much! My class is now in the process of writing thank you notes to you in either simile, metaphor, poem, or alliteration form. They're having fun with it. We'll be sending those off probably on Friday..."
Sherlock Poems, Poetry Detective, making another mistake. "...Students were thrilled to have Jeff Nathan visit and very inspired to write their own poems...Kids' comments: poems were hysterical, entertaining, enjoyed character - Sherlock Poems, enjoyed presentation because he acted it out, loved wordplay, ...'"
"I have seen many, many author presentations in my business and in my 35 years teaching. Jeff Nathan is definitely tops! His enthusiasm, energy and humor make learning about poetry so much fun! The students of all grades are enthralled with him and "Sherlock Poems". I give Jeff a "10" in all areas, from educational content to presentation pizzazz, to the children's humor that even had me laughing till my stomach was sore. If you bring him to your school, you will not be disappointed." "On behalf of Mayo School I would like to thank Jeff Nathan for sharing his talents with our entire school. His program had our students on their feet with excitement and laughter. As a parent it was my pleasure to see the children smiling and learning. I especially enjoyed how Jeff incorporated his knowledge and experience of the poetry writing process ... We highly recommend this program for any k-5th grade school. ... Thanks again Jeff." Gloriann Switzer PTA Enrichment Coordinator Mayo Elementary Holden, MA "
"Jeff Nathan does an incredible job at making poetry come to life..........heartwarming to see the students sooooo involved and mesmerized!!!!!" "...Thank you for such an informative, yet entertaining program you put on for our classes yesterday. I've been teaching 4th grade for over 30 years, and during that time I have listened to many children's authors, poets, and illustrators. A number of these people were greatly talented, but were not able to connect with the large groups of students. Their talks were "dry" and did not engage the children. I was so pleased that your poetry is humorous and so is your delivery of it. The students were attentive the entire hour as they never knew what you would do next. What a great variety of props, costumes, and resources! They also enjoyed your small group instruction on similes and metaphors as you made it fun. You are truly a children's poet." "Hi! You performed at Chestnut Hill Elementary School in Dix Hills, NY in the Fall. As an early childhood teacher of first graders, I am always looking for interesting poetry and a way to "hook the kids" on writing and literature. Your presentation did just that! My first grade students were so excited and motivated by your performance. ... I was interested in looking through your books ... to use in my teaching but when I got to the school library I was too late -the books had been checked out already. ... My students especially loved the poem about baseball. Your enthusiastic dramatization of your poems was exceptional. Thanks for showing the children how much fun writing and reading can be!!!" His programs feature crazy poems, like "The Buzz," and silly songs, like "On Top of My Doggie"
"Jeff got the students so excited about poetry that many of our library books on the subject were checked out by the end of the day!" "Jeff Nathan visited our school this fall, and treated our school to some wonderful assemblies! Both students and staff agree that his programs are a mix of just the "right stuff." The students in kindergarten through grade five enjoyed Jeff's interactive approach to learning about poetry. Teachers were delighted with his ability to keep the students interested, no matter what age level. He has something that appeals to all. Jeff's programs involve the children and keep them engaged from beginning to end. Best of all, they learned about poetry while they were having fun. We are hoping to invite Jeff Nathan back next year." "Jeff's program was loaded with enthusiasm! He inspired my students to create wonderful poetry. His humorous poetry reading and guitar playing kept the kids laughing and learning. Jeff has fun turning ordinary objects into silly poems! The kids loved asking him questions about writing. My students had a blast! " "Thank you for a wonderful visit! Children, teachers and parents are still raving about you!!!! ..."
"Jeff Nathan is a dynamic performer who had students from kindergarten through fourth grade excited about poetry. He conducted three separate assemblies for the different grade levels. Our fourth graders received a special treat as Mr. Nathan visited their classrooms to conduct mini-workshops on poetry. Students and staff were talking about him for days!" Thank you so much for coming to our school and my classroom. My students were captivated during your morning assembly, and they were even more enthralled with your classroom visit. I was impressed by how engaged the kids were with metaphors, similes and poetic license, and your music had them jumping up and down. I recommend your presentation to other third and fourth grade teachers. Thanks!" 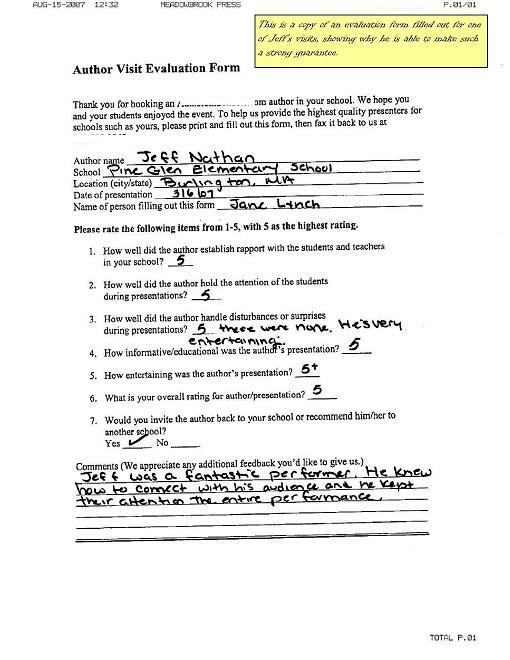 "Jeff Nathan did great presentations at our school for grades K-4. He was extremely entertaining for all the grades and really helped the kids to see how much fun poetry and English grammar can be. The teachers were able to leave the presentations and immediately go back and reinforce the learning. Great presentations!" 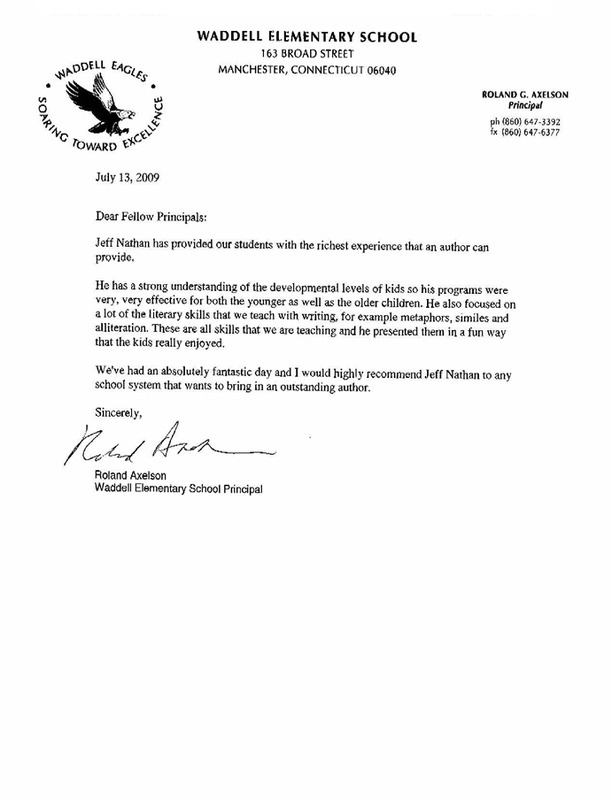 "I recently brought Massachusetts children's author Jeff Nathan in to work with my 3rd and 4th grade students. Jeff ... introduces similes, metaphors, poetic license, and interpretation of poetry with a lot of humor, a little music, and impressive Powerpoint technology...This program is so strong that I offered to serve as a reference." "My second grade class was enthralled with Jeff Nathan's presentation. He brought his poems alive. It was the perfect way to show the students how to make a mental image." "Jeff Nathan’s presentations were very age appropriate, informative, and entertaining. His pleasant, entertaining style captured and maintained the interest of our students at each grade level. I would highly recommend Jeff Nathan." "Jeff Nathan came to the Peter W. Reilly School today and gave a presentation to our school. It was most enjoyable, the students enjoyed the PunOETRY and had some fun. Isn't this what education is all about? To engage children with exciting literature to motivate them to read and write in this day of technology is quite rare. Hats off to Jeff for his sense of humor, caring, and sharing." "Jeff Nathan visited Griffin Memorial School and had a chance to meet with all the children in grades 1-4. As an educator, it was very exciting to watch the kids learn that poetry is fun and can be used in any life situation. Jeff's interaction with eh children was wonderful. The teachers and staff had a great time, too! I would highly recommend Jeff Nathan as a part of an enrichment program for your school." "Jeff’s performances were wonderful. He was full of energy and made every moment count. Jeff easily adapted each presentation to suit particular audiences. Students left feeling excited about poetry and Language Arts. Teachers and parents also thoroughly enjoyed Jeff’s presentations. A job well done!" "This morning was awesome when you did an assembly for fourth and fifth grade, At Charlotte Ave! In library we acted out or read your poems and me and my friend do Physical Physical. I loved the part where you did the "Take Me Out of the ball game". that was sooo much fun. I never understood similes and metaphors until you taught us. I have read your books and I'm totally going to tell my friends in Greenfield about your books. It was also funny when you were Sherlock Poems the mustache was awkward and made me laugh. Thank you for coming and you ARE an inspiration." "p.s I looked up your e-mail address on the internet so I could thank you for having a privilege to have an author at our school." question in his own inimitable way. Contact Jeff for classroom visit options. Want to preview Jeff's assemblies? Call for 2012-2013 fees and how to get funding assistance. - High-tech presentations that hold interest & teach/reinforce fundamental values: writing process, language art concepts, that writing and poetry can be fun, and many other important lessons for children. 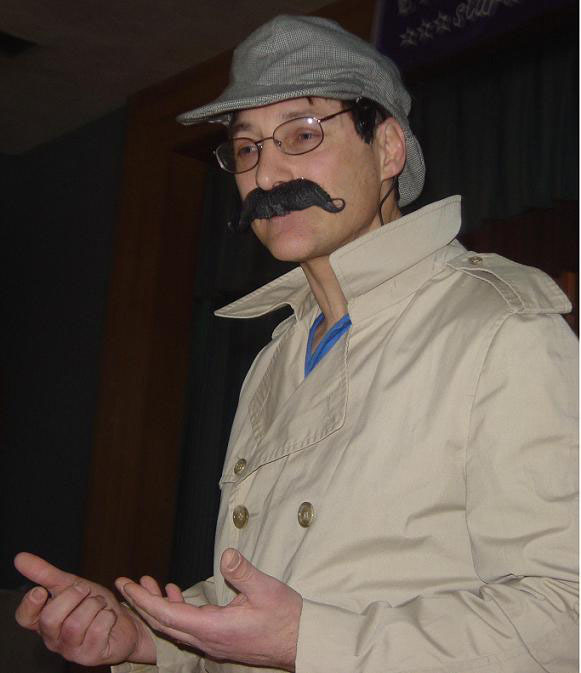 - Sherlock Poems, an invited guest to his intermediate assemblies, to "help" solve the case at hand. Jeff, signing a book he gave to the "Poetry Detective of the Day"
Copyright © 2000 - 2012 by Award-Winning Author, Jeff Nathan. All rights reserved. All Trademarks property of Chucklebooks Publishing Inc.